Jack Bauer, Bill Buchanan, Chloe O'Brian, Tony Almeida and Aaron Pierce all arrive at the Arlington, Virginia DMV. No one is happy. CHLOE: I don't understand why we're here, Mr. Buchanan. Most of these transactions can be done online. BUCHANAN: Chloe, it's more complicated than that. Jack when was the last time you carried a valid driver's license? JACK (counting fingers, muttering to himself): Not since we invaded the Chinese Embassy, Bill. So we're talking at least ten years. BUCHANAN: And Tony's a fugitive, so we need Agent Pierce to register Tony's new vanity plates for his El Camino. CHLOE: What's your personalized plate say? CHLOE: Tony, if it's on the back of your car, it won't be classified anymore! TONY: Exactly- it will be in plain sight, no one will suspect a thing. BUCHANAN: Just nod and agree, Chloe. And I got a summons for an illegal window tint on this purple van. Normally, I'd ditch the vehicle and blow it up, but I really enjoy the way Jethro Tull pipes through these bitchin' speakers. JACK (muttering): No rock band should have a flute. BUCHANAN: I'm sorry, Jack I couldn't hear you back there (cranks volume). PIERCE: Please, God let's get this over with. The group enters the DMV office. It's packed. TONY: Should I start shooting up the place? CHLOE: I did some research on your test, Jack. There's a 90 percent chance you will be asked to parallel park. I just wanted you to know that. (silence) Do you have all of your forms filled-out and ready? JACK: I have the DL-1P, the MED-4 and a pardon from the President of the United States for all of the damage I'm about to cause on this road-test. Stick with the others, I'm going to the front of the line. Jack walks past two dozen people, all giving him dirty looks along the way. He arrives at the counter and meets an angry-looking woman. 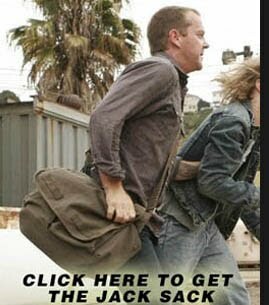 JACK: My name is Jack Bauer, I'm a federal- wait. I'm here to take a road-test today. WOMAN: Do you have a number? JACK: No, I don't have a number. I need you to do me a favor and call your boss and get clearance for me to take my road-test now. WOMAN: Sir, without a number, you cannot even be talking to me, NEXT ON LINE, PLEASE! JACK: Lady, you have no idea how far I'm willing to go to acquire your cooperation. JACK: That's not what I meant- (sigh) Dammit. Agent Pierce and Tony are sitting next to one another in complete silence. Tony looks down at his number ticket. He then looks at Pierce, who's staring into nothingness. Pierce notices Tony's glare. PIERCE: I've been given orders not to talk to you. TONY: Don't you want to know what my plates are about? Pierce looks down at the application. It reads "DEEPGUY." PIERCE: You reading a lot of self-help books? TONY: What are you talking about? (Tony reads the application) No, no, no, Chloe brought Larry Moss' application by accident! Mine's supposed to say "DEEPSKY!" PIERCE: Sure it does. Don't be shy... guy (half-smiles). BUCHANAN: These are street legal tints, trust me. I used to be the director of a federal agency, I know the law. INSPECTOR: Apparently you weren't working for the Federal Bureau of Window-tints, mister. That's my jurisdiction. CHLOE: There's no need to be snarky about it, sir. INSPECTOR: Lady, is this your first time at the DMV? BUCHANAN: How long will it take to have my windows inspected? Bill tugs on Chloe's sleeve and motions for them to walk away. They are now crossing the floor to where Jack is standing. WOMAN: Do you have any current identification? JACK: I have a valid driver's license for the Democratic Republic of Sangala. WOMAN: Woah, easy there hot-stuff. Sangala? Never heard of it. Jack hands her the ID. WOMAN: Phew, this is going to take some more paperwork. Here's form DL-7- exchanging a driver's license from another country. BUCHANAN: JACK! Jack! We've hit some roadblocks here. Let's just get that Presidential Pardon to include my van's tints, ok? Holding up his pardon in front of the lady's face. JACK: And I'll get it to cover my driving without a license... again. Tony and Pierce walk up to the others now. JACK: We're leaving here, Tony. You have a smoke grenade on you? TONY: Of course I do. (hands him the grenade) What's up? JACK: You got a form for this thing, lady? Jack pulls the pin and throws over the counter. All of the DMV workers scramble as purple smoke fills the main floor. ROFL! Ya made my whole day, Adam. What I love most about your fan fics is the film playing in my head. Thank you, TJ- I heard your footsteps coming and posted! Funniest thing . . . evah!!! The second read is even funnier. The thought of Bill being pulled over for tinted windows. You can just see him smooth-talking his way through it. There's no end to the situations you can do. Any normal-type activity they do as a team has great potential. 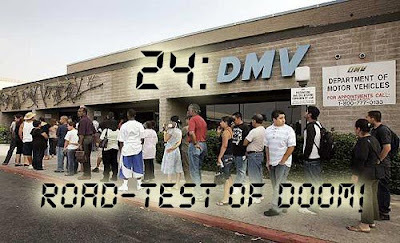 sometimes when i get through with the DMV i wish I could throw a grenade. Thanks guys, I'm glad you enjoyed this one. It was actually kind of tough to whittle this one down- there are so many frustrating aspects to the DMV experience and I didn't want it to be just Jack freaking out. I like the bowling league idea, Ivan- do you have a link to your story? I'd love to read/share it. And TJ, Buchanan is my favorite fan-fic character for that reason- he's a smooth guy who has a real upside for being the strangest of the group. For my next fan-fic post, what do you all think of them explaining the DTV conversion to Buchanan's elderly Aunt Ruth? Ivan- if it's not too much trouble, email me at thejacksack@gmail.com and we'll talk out the details (length, etc.). I'd love to see them in one of those big super-discount warehouse places -- the kind that sells those packages of, like, 48 rolls of toilet paper -- laying in supplies for the bat cave.